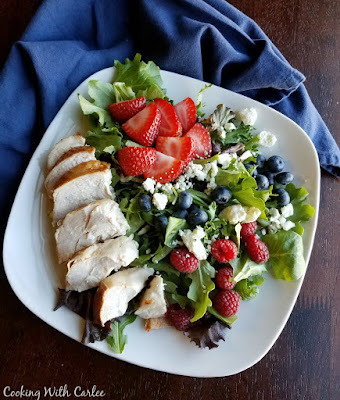 This dinner salad is perfect for Memorial Day, the 4th or July or any day! It is full of berries, cheese, greens, and chicken. There is also a homemade dressing recipe if you'd like! It's almost the 4th of July! I always love these patriotic holidays and all of the red, white and blue. I think it's important to have a sense of pride about where you're from, even if it's not always sunshine and roses. Even if you aren't from the United States, I am sure you can appreciate that sense of patriotism and hopefully you have a similar pride for your home. No matter where you are, you can enjoy this salad. We actually had our big holiday weekend festivities yesterday. My brother roasted a hog and we all got together with too much food and plenty of fun. Tonight we're reconvening for my god-mother and god-daughter's birthdays. So by the time the 4th comes we'll be ready to take it easy. Just because we won't be going anywhere doesn't mean we can't celebrate. We'll just be doing it in a more low key way. Like with these delicious dinner salads! I love berries. I can't get enough of them! So you'll see I have a lot or red, white and blue sweet treats that get their kick of color from fruit. Whether it's two bite berry pies, delicious waffles or a bundt cake, I love getting the point across without needing a bucket of food coloring. Berries can also be used to make festive main course dinner salads. Drop the chicken and you have a fun starter as well! I know fruit in salads riles up some folks, but I love it. Throw some fruit, nuts and cheese on a salad and put it in the menu and I am going to have a hard time passing it up. The best part is how easy this makes putting dinner on the table. It takes longer to get the ingredients out for the dressing than it takes to put together. In a pinch you could always use a poppy seed dressing or raspberry vinaigrette. I used the breasts from a smoked chicken, but you could just as easily use a rotisserie chicken or some from the grill. Then just pile it up according to your liking! I also love taking this salad to work for lunch. In fact I had it all 5 days last week! I just put the dressing on the bottom of the bowl and then loaded it up with greens, berries and bleu cheese. Then at lunch time I mixed it up and devoured it. It was sooooo good and putting the dressing on the bottom kept the green from getting too wilty while waiting for lunch time. If you love salad like this, you are also going to love my fruit and chicken salad with homemade poppy seed dressing or my fall apple dinner salad. They are both loaded with good stuff and have super simple to make salad dressing recipes as well! This is one of my favorite salad combinations. 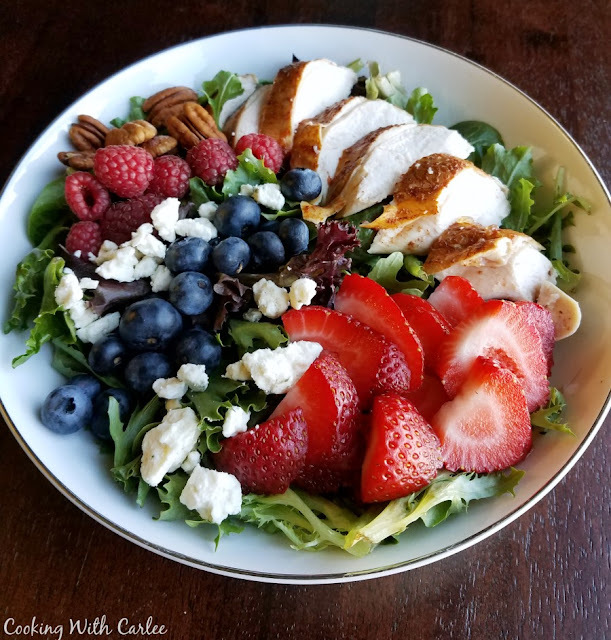 Fruit, cheese, nuts, chicken and greens with a simple dressing is the perfect spring or summer meal! If you are running short on time, you can use a prepared poppy seed dressing, raspberry vinaigrette or bleu cheese dressing. Yum! I like to make my dressing in a mason jar. Just add all of the ingredients and tightly cap the jar. Give it all a good shake until it's well mixed. Adjust the seasoning to your liking and then store in the refrigerator until ready to use. It can be stored refrigerated for a couple of weeks. Just give it another shake before using and you are ready to go! Alternatively you can whisk together the dressing in a bowl. Add all ingredients but the olive oil and whisk until mixed. Then slowly drizzle in the olive oil while whisking until ingredients are combined. Store in an airtight container in the refrigerator until ready to use. I prefer to dress my greens first. Add the greens to a large bowl and add a bit of dressing. Toss greens to coat and adjust amount of dressing to your liking. Place greens on your serving plate. 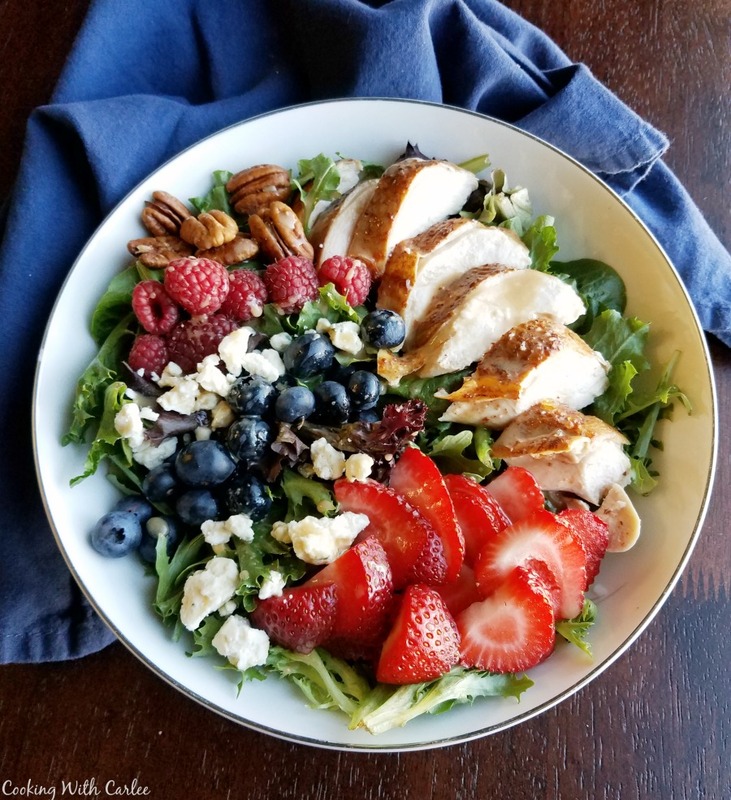 Arrange chicken, berries, cheese and nuts over salad and serve. Alternatively you can arrange dry greens on your plate, top with berries, chicken, cheese and nuts and then drizzle with dressing. For a take and eat lunch, put the dressing in the bottom of a bowl or jar. Top with greens and toppings and seal tightly. When ready to eat, just toss the salad and enjoy! That is my kind of red, white and blue dish! I love salads and that has all my favorite things on it. YUM! I love this kind of salad too. I order them out at least 50% of the time we are out to eat, which admittedly isn't often. I need to make more at home! It was easy and delicious! This is my kind of salad! Love the red, white and blue perfect for the holiday! YUM! YUM! This is gorgeous, Carlee!! I'd make extra to have for lunch all week long! Thanks, Liz! That is exactly what I did too! Oh, what a great salad! Perfect for the summer time! fruit, nuts, and cheese on a salad? I'm with you! It's my favorite kind of salad! I love all of the fresh fruit. Yum! Now this is an entree salad I could enjoy! All those flavors and textures topped off with sweet berries. Yum! It is my favorite salad combination, especially during spring and summer! Thanks, Chris! This looks delicious and perfect for anytime this summer. Love everything in that salad! So yummy and fresh! This is a perfect main dish salad for any day of the year. I think so too! Thanks, Wendy! It's perfect for a hot summer's day. Thanks, Deepika! You could always use feta or something instead if you'd like, but you could also leave it off. It would be delicious either way! I'm with you on this salad, so fresh and colorful! Hi Carlee, Happy 4th of July! I hope you have spent the day chillaxing and eating! I would love to do this recipe, but the only berries we can get this time of year are frozen and I don't think that would work so well! I will be trying your dressing though. There was definitely plenty of eating! Thanks, Debbie! Our berry season is winding down now too, which is a shame. We have access year round, mostly shipped from afar. But they get expensive and flavorless if you get too far out of season. So stuff like this is best enjoyed in spring and early summer... then onto other things! I've been in love with this salad since seeing it on instagram! I love adding fruit to my salads, which is going to be black raspberries for us this week. I'll be subbing those in for your blueberries! Thank you! Black raspberries would be awesome! My brother has some growing wild at his place and he brought a bunch of them to family dinner not long ago. They didn't last long! Our blackberries are starting to peter out, so I am going to be missing berry season shortly. I just love berry season! I am so into salads right now! This is right up my alley! thanks for sharing on Celebrate 365! Me too! I just bought all of the stuff to make them again! So cute! With the weather consistently in the high 90s+ here in Virginia, I am craving fresh salads for lunch and dinner. I completely agree! We had a very similar salad for dinner again tonight! That has to be the perfect hot summer day recipe and it has something for everyone! Love it!! I have been bringing smaller versions of it to work for a few weeks straight! Even my husband requested it for dinner again... so I'd say it's a winner! Thanks so much, Molly! I love salads. This looks so much better than eating out. I think some of the fancy restaurants could hire you!! I am all about fruit on my salads! Give me some fruit, some nuts, some cheese, some dried fruit even and I am a happy girl. This looks amazing. Pinned. Me too! My favorite salads are loaded with all the good stuff. Thank you! Carlee, this is a perfect salad! Salads like these are some of my favorites for sure. I can't wait to see yours!